Report: Who the hell are those Khabib Army bros from UFC Embedded? Home MMA News Report: Who the hell are those Khabib Army bros from UFC Embedded? *Extremely Khabib voice* I don’t like this. Who knew today would be the day when we found a video that make us long for simpler times. I think we would rather watch Khabib Nurmagomedov pay homeless people to do push-ups then watch another second of Khabib’s Army. What is Khabib’s Army? We are not sure. 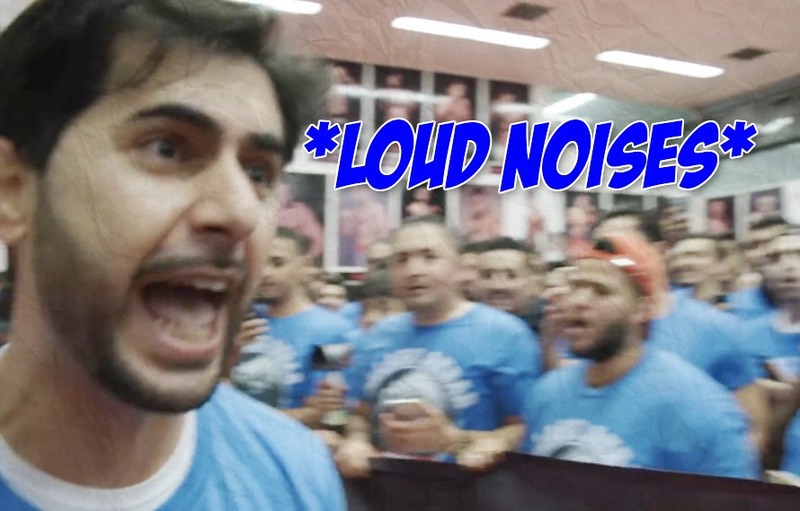 In an effort to motivate his prize fighter American Kickboxing Academy coach Javier Mendez allowed some fans to rush the gym for some kind of twisted pep really. We have spirit yes we do, we have spirit how about you? Would be 1,000 times less cringe-worthy then the video below. We appreciate the enthusiasm but what the hell is going on here? What are you guys doing to Khabib? The UFC lightweight champ looks like death as he begins his weight cut for UFC 229 and just 50 dude-bros in matching shirts came running up on him. Our Russian Killer looks visibly uncomfortable. *Extremely Khabib voice* Why are you filming this? Please stop. Don’t hit record. So hyped. Behind hyped. And we assume they are doing these actions 100% sober. What is going on here? Poor Nurmagomedov. The UFC has somehow made Nurmagomedov the sympathetic figure in his fight vs. Conor McGregor, thanks to this clip. We feel bad you had to sit through whatever the hell that was. Oh no. Here is a longer version of the pep rally from an alternate angle. Look we don’t want to tell you how to fan but don’t be these fans. Khabib’s Army must be stopped, Conor McGregor our nation turn its lonely eyes to you.